Ever since I made my own pizza at home one day, I realized what I had been missing out on. I was so glad at how much better it tasted, and how much healthier it was. Making your own pizza is fun and really easy once you find that one perfect pizza dough recipe. The recipe I’m using to make this pizza dough is from Taste for Adventure. Its the best dough I have made so far, and it’s completely whole wheat. It turned out perfectly crisp, tasty and contrary to belief, not hard and too chewy. I made two different kinds of pizzas with this crust, and I loved them both, until there was no pizza left. Click here if you want to get some topping ideas! Now roll up your sleeves and get out the flour. Let’s make some pizza dough! In a small bowl, mix 2 1/4 teaspoons of yeast and 1 teaspoon of sugar. Microwave 1 cup of water. Make sure it’s warm nothot. About 30-45 seconds. Add the water to the yeast and sugar mixture. Give it a little stir and let it sit for 5 minutes until it becomes frothy. Yeast mixture after yeast has activated for 5 minutes. Ready to use! In a large bowl, mix 2 cups of the whole wheat flour, 1 teaspoon of sugar and 3/4 teaspoon salt. Make a little well in the center of the flour mixture and add in 1 tablespoon of olive oil and the yeast mixture. Mix from the center and out, incorporating a bit of the flour at a time into the well. Mix until the dough comes together. At this point, it will be rather sticky. Take the rest of the flour, and sprinkle in 1 tablespoon at a time onto the dough, while kneading it in. Keep adding flour until the dough is no longer sticky. Doing it this way ensures that you don’t get dry dough. Form the dough into a ball and let it sit in a floured or greased bowl. Cover it with greased plastic wrap. Let the dough sit in a warm place for 45 minutes to 1 hour, until it doubles in size. And that’s it. The dough is ready to use! Go on, roll it out, top it off, bake it, and eat it. 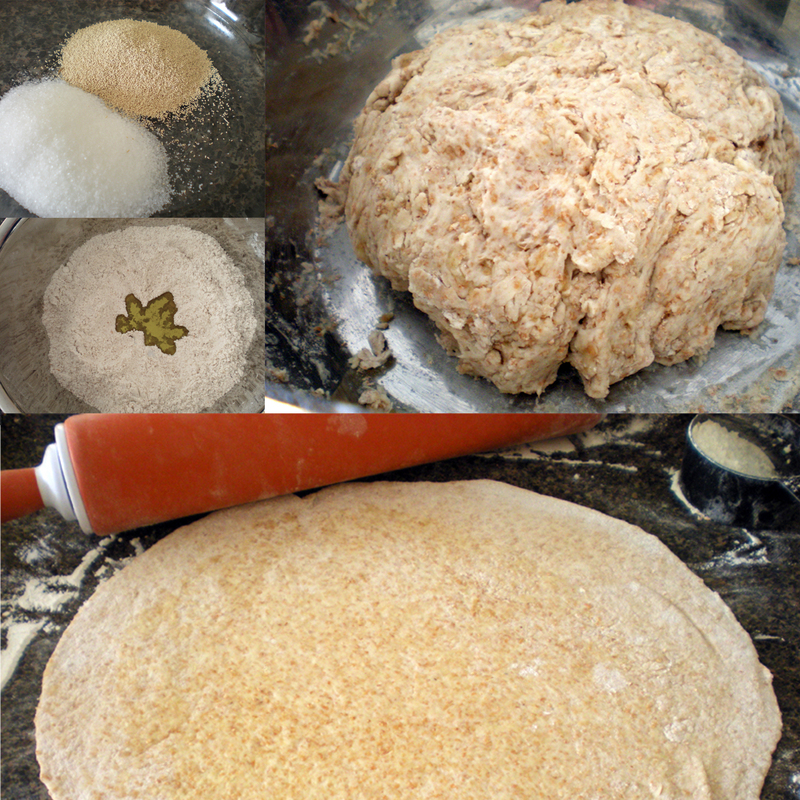 I made homemade whole wheat pizza dough last week. Now, the flavor was fine, but the texture was terrible, sort of dry and cardboard-y. The recipe I used was pretty similar to this. Was something off in my technique, or is that just how w.w. pizza crust is? Whole wheat flour does give dough a bit of “rougher” texture but it shouldn’t be dry and cardboard like! Maybe you over worked your dough, or didn’t give it enough time to rise? Whole wheat dough is delicious. I do hope you try making it again :) Good luck! It could have been the rise time thing, since I was in a hurry. The recipe also called for par-baking the crust, which I usually don’t do, but I gave it a try anyway. That might have dried it out more. I usually make 1/2 whole wheat, 1/2 white flour pizza crust. I may give 100% whole wheat another try, though.